Happy Groundhog Day! I didn't have a chance to post the new deal and kit of the month from Creative Charms yesterday - I hope that you are following the Creative Charms blog and may have had a chance to see these great bundles there already. The featured line for February is the Simplicity line. This black and white line has a great sophisticated style and can be used on all sorts of projects. The Kit and the Deal compliment each other so you might want to order both. They also each have enough product to be a really useful bargain. Here is the Kit of the Month- it is called "Simply the Best" and there are 62 pieces included for just $14.99. The Deal of the Month is called "Simply More" and contains 194 pieces for just $6.99. 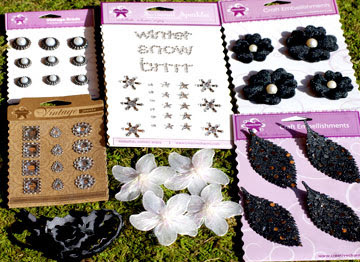 I'll be sharing some projects I made with these kits a little later this month. Don't forget to visit the Creative Charms Blog for some Blog Treats, leave a comment on Facebook and "Like" Creative Charms for a chance to win a free Kit of the Month. You will need to explain how you would use this month's Kit of the Month. Here is one more photo from the last day of CHA. I got to meet Tim Holtz and watch him work as he explained his latest products. He is so gracious about posing for photos and every bit as nice as he seems in his videos. I'll add this to my growing collection of photos of me with crafting celebrities. So far, my flight home Wednesday evening is listed as "on time" - please keep your fingers crossed that I actually do get to fly home safely! I have lots more to share once I get settled in at home. Love these kits. That butterfly would be great on a card, a LO. I am so jealous you got to meet Tim Holtz. Fingers crossed for an "on time" flight home. Be safe. I love the black and green together on those flowers. How pretty. Thanks for letting us know about these deals. The black and white are so pretty. I am trying to come up with something to scrap with them. One of my favorite cards is a black card with white embossing. 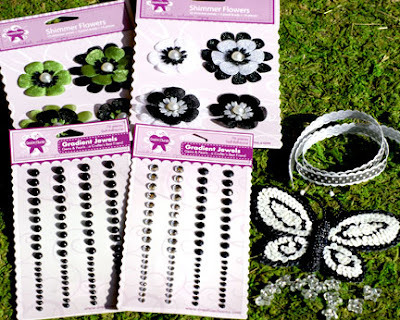 I really like the black/white color scheme - very pretty! 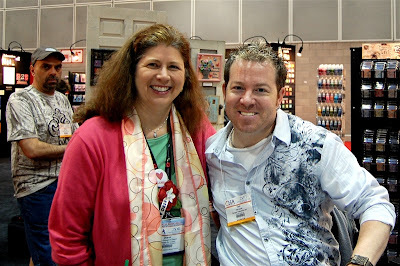 I got to take a class from Tim Holtz in Buffalo last June! He rocks!! Hope you're home safely by the time you read this!